Up at 6.30a.m. cloudless skies. Having hogged the driving yesterday I let Peter start. We set off with a flourish up the wrong road, OOPS! A quick U-turn where it says NO LEFT TURN sorts the problem and we lose the Healey that had tried to follow us. Just living up to our reputation. Fortunately no cops about. Onto Route 60 off Interstate 64, through Hamburg. A gentle winding single lane road leads through tree laden valleys. We follow an old single track railway line grass growing through the rails and rejoin Route 50 at Huron. On Past Loogootee, farms are getting bigger, countryside more open and levelling out. We circuit Vincennes and cross the Wabash river into Illinois. Evidence of irrigation, roads getting straighter, farms getting bigger, trees getting fewer. We pass through Olney, the home of the white squirrel. No sign of other Healeys to-day, we are on our own. Something we never dared do on the ATW Rally. It's quite a treat. We head on into St. Louis, our stop for two days. 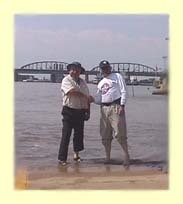 Peter and Julian paddle in the Mississippi. We wander round the museum and wish we could spend more time but we have a rendez-vous with all the cars back at Helen Fitzgerald's pub. 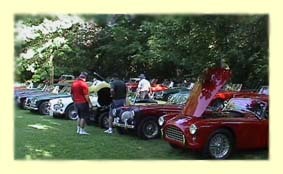 There has been an article in the local paper telling people to come and look at these beautiful cars. By now we have 20 Healeys in tow. 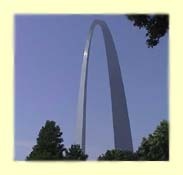 We have a rest day in St Louis and a group of us head into town to see the famous Arch, the gateway to the West. There is a museum at the base with the history of the pioneers Clarke and Lewis. I purchase the book for bedtime reading. Five of us squeeze into a time capsule built for two and speed to the top of the arch, all of 630 feet high, taller than the London eye. It is a major achievement in engineering and beautiful to behold. A very pleasant day is rounded off with an incredible bar-b-que at Keith Bester's home. He kindly put up Julian, Lawrence, Clive and Pam, giving them the run of the house while he moved out to his girl friend's for the two nights. There was a great line up of cars in his garden which I have tried to capture. The one nearest with the bonnet up is an interloper, a beautiful AC Bristol.